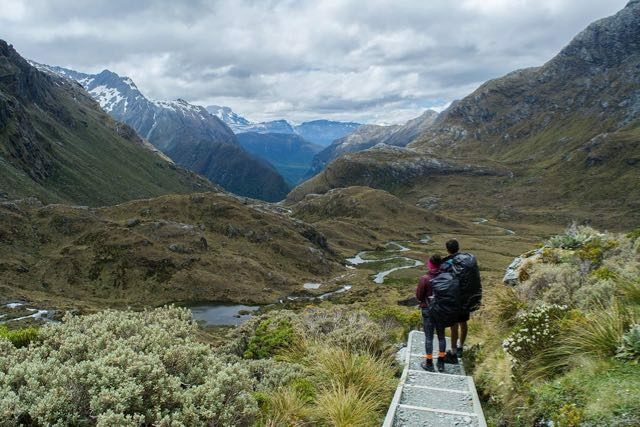 Hiking the Routeburn Track - Ghumakkar - Inspiring travel experiences. 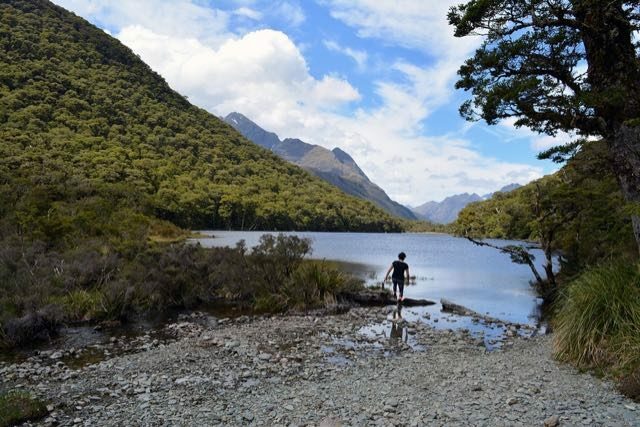 Since falling in love with the South Island of New Zealand earlier this year, my family and I were longing to go back. 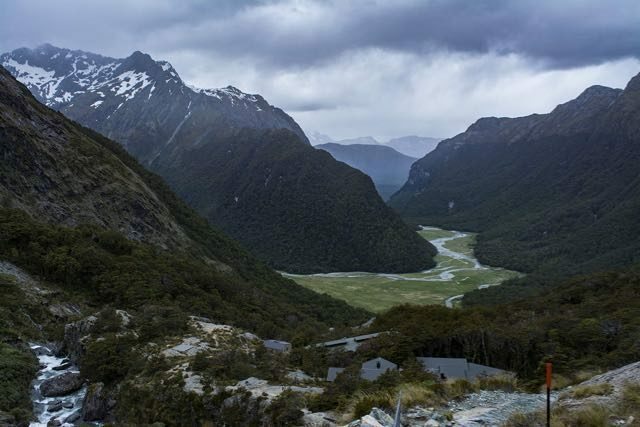 However, we didn’t want to see the towering mountains of Fiordland National Park with seat-belts strapped over us. We wanted to be in the mountains. 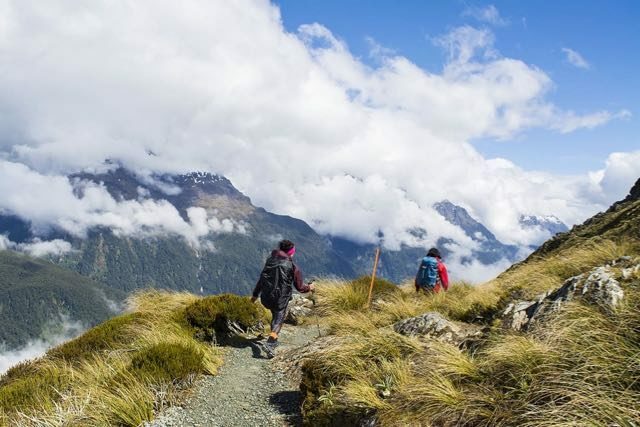 Routeburn Track – a 33 km trail that takes you through the lush bush and mountains of Fiordland and Mt Aspiring National Parks. minimum. The entire list of items we took can be found on my personal blog here. greeted us at the top. 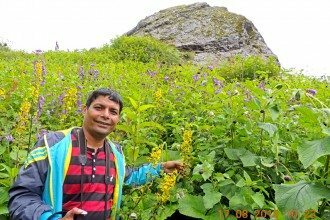 We continued walking, sometimes ascending and descending. Along the way, we passed Howden hut which is tucked next to Lake Howden. A stunning waterfall called Earland Falls surprised us on our way to Lake Mackenzie hut. At a height of 174m, it appears monstrous. As we walked by, it sprayed icy, cold water on us, nearly getting us drenched! There is a flood detour kept in place because heavy rain makes the waterfall impassable. Taking photos here was impossible. contains bunks while the bottom floor is the main area with the kitchen, tables and sitting area with a fireplace. Toilets are in a separate building a few meters away from the hut. Additional bunks are kept in another hut in the same area. After enjoying a cup of luscious soup, my sister and I took a not-so-comfortable dip in the freezing lake water. The hut warden had a meeting with all the walkers at 7.30, giving track information, weather and updates. Then, it was time to call it a day, and we head off for much needed Zzzz. The next day, we started climbing. 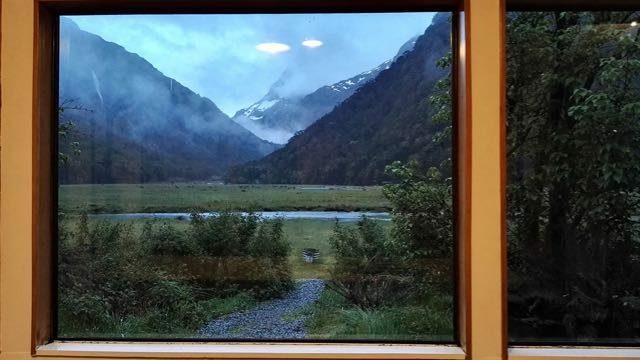 But this time, we were receiving constant views of the hut, Lake Mackenzie and the mountains overshadowing them. 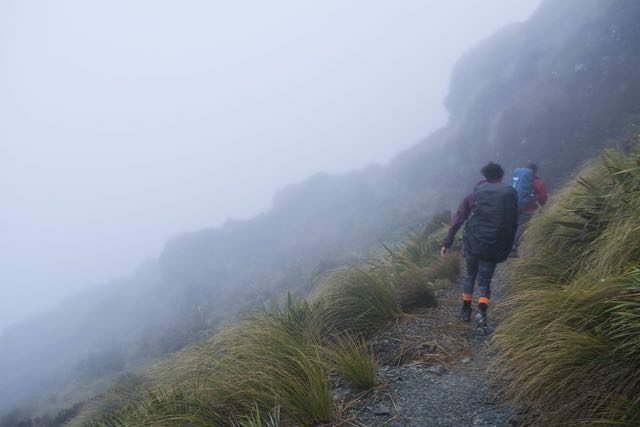 After we crossed the mountain, all we could see was mist. Visibility was reduced to a minimum and we could hardly see each other. After about 30 minutes, the mist suddenly cleared. 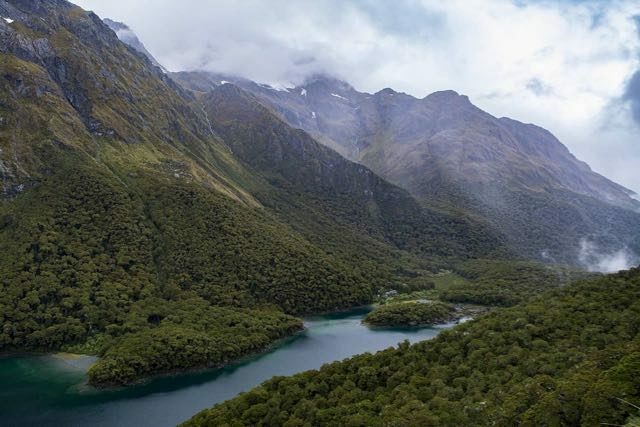 Views of the granite wall of Darran mountains and the Hollyford Valley surprised us. It instantly became a sunny day and what we saw was overwhelming. on our way. 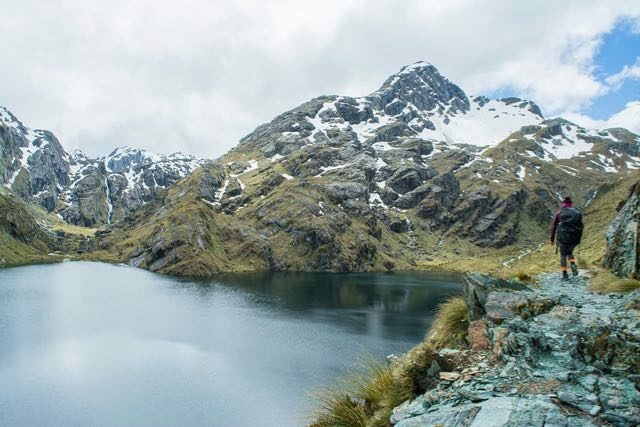 Just as we reached the highest point of the Routeburn Track, a vast alpine lake called Harris Lake appeared down below us. Melted snow in the form of rapid waterfalls fell into the lake from the peaks surrounding it. We were stunned beyond words, once again. 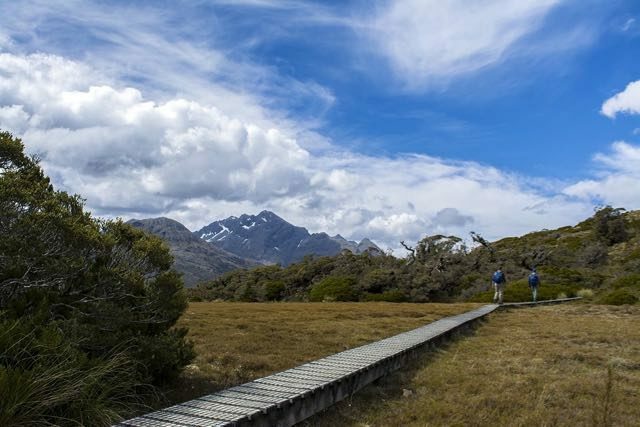 bridges and boardwalks, a further descent led us past Routeburn Falls (continuation of the river) to Routeburn Falls hut. This wasn’t the hut we were going to be staying in, but was a good place for a rest. 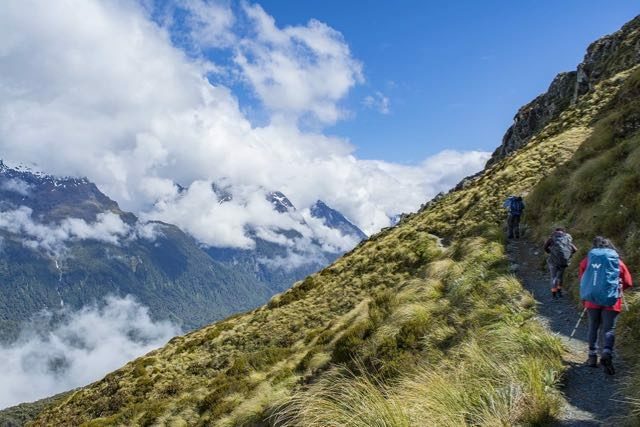 A further hour of steep downhill walking led us to our destination: Routeburn Flats hut. 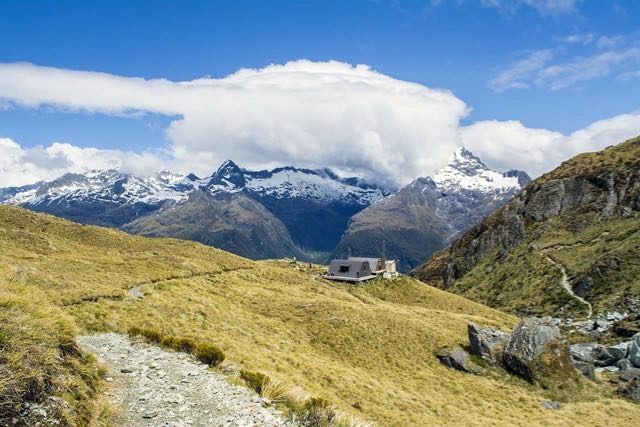 Our hut was built on extensively flat terrain, providing 360 degree views of the majestic mountains. Since the hut only contained 20 bunks, it was less crowded and peaceful. us the entire way, giving us frequent opportunities to cross suspension bridges. Finally, we saw civilization and scrambled out of the bush. Hi there! 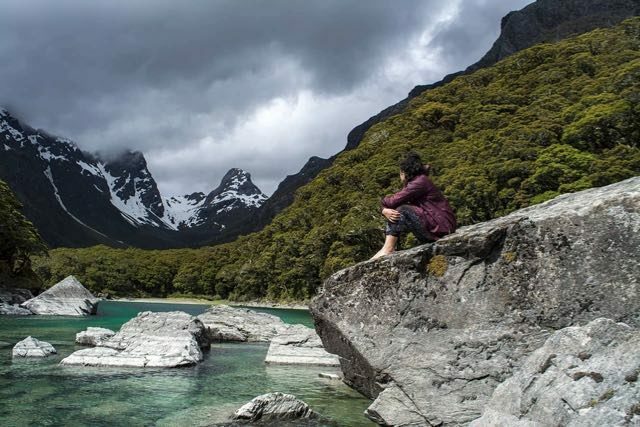 I'm a solo New Zealand film-maker and writer. 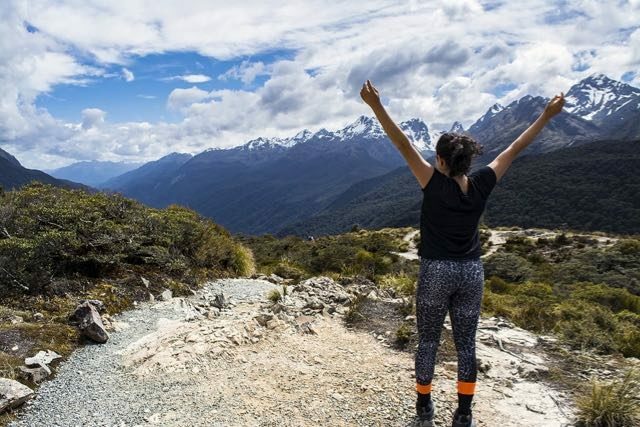 I absolutely love travelling, hiking and exploring new places. My prime focus is always on capturing different locations in their purest form on film to inspire others to travel and enjoy life. Excellent tale of an amazing place. 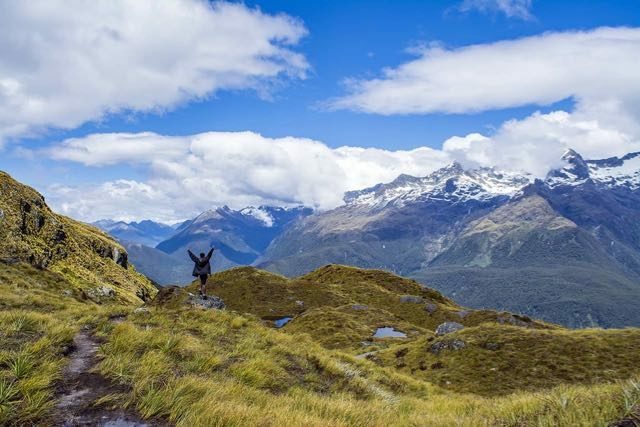 New Zealand no doubt is a beautiful land and you’ve captured it’s essence with both words and camera. Thanks for taking us all the way to the end of the earth. Apologize for reading it this late, but I wonder how I missed it. Thank you for e-touring us in New Zealand. Where are you taking us next? Thank you!! Glad that you enjoyed reading this story! I am currently writing + making a video for my latest adventure which was in UAE!